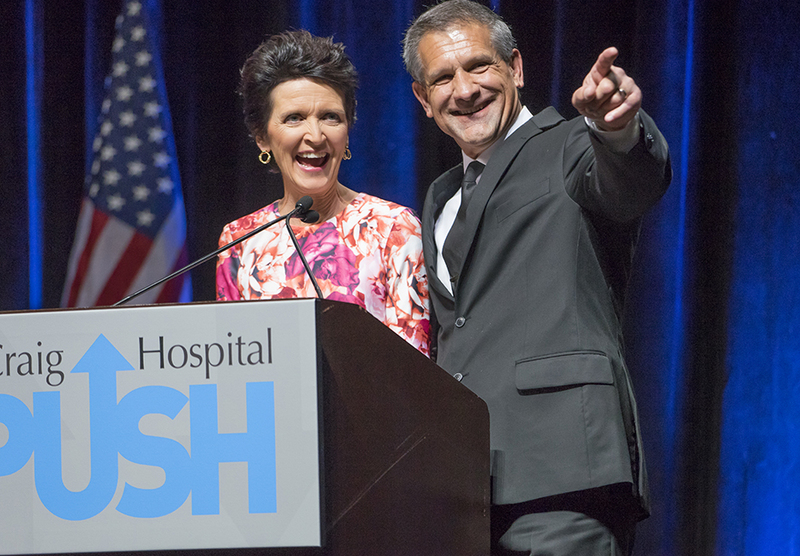 Englewood, Colo.— Craig Hospital’s biggest fundraising event of the year, the annual PUSH dinner, was held on Saturday, April 30. More than 1300 people attended the event, which was presented by Great West Financial-Empower Retirement. The gala event raised a record-breaking $1.8 million to support Craig Hospital’s programs, research, and patients. PUSH support Craig’s Programs of Excellence, including Therapeutic Recreation, Adaptive Technology, Music Therapy, Community Reintegration and education and tutoring programs – which are generally not covered by insurance. PUSH funds also support research, including ongoing studies and clinical trials aimed at improving outcomes, reducing long-term complications, and enhancing quality of life for those affected by spinal cord and traumatic brain injury. The PUSH paddle auction raised funds for the Craig Hospital Foundation’s Patient Assistance Fund, which helps patients with minimal income or inadequate insurance travel to and from Craig, purchase equipment like wheelchairs and shower chairs, remodel homes for accessibility, train caregivers, pay mortgages and utility bills, and meet other urgent needs. Craig graduate and benefactor Don Digby and his wife Lydia made a $300,000 challenge gift to encourage others to give. 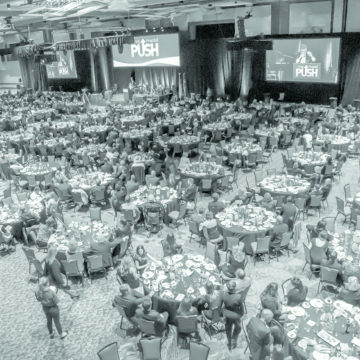 PUSH attendees met the challenge, donating $365,875 during the paddle auction. 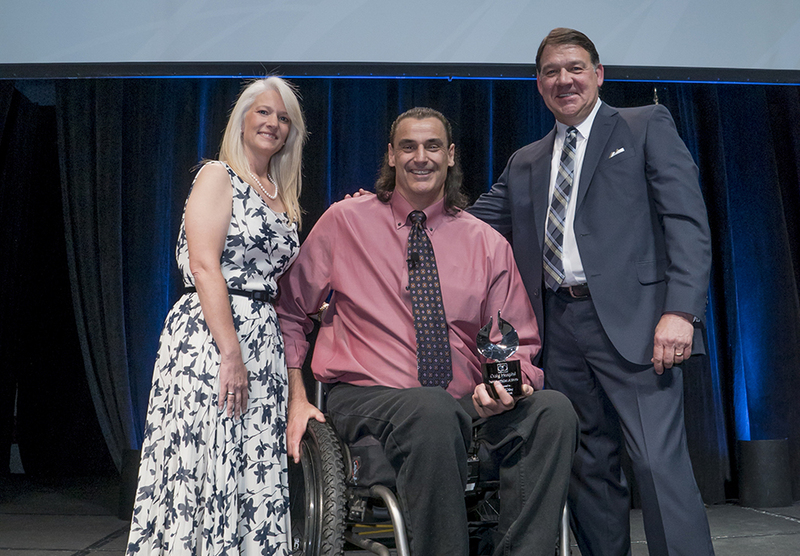 At the 2016 PUSH, the Inspiration Award was given to Mike Utley. On November 17, 1991, the Detroit Lions’ offensive guard was paralyzed during an NFL game against the Los Angeles Rams at the Silverdome in Detroit, MI. Mike’s courageous “Thumbs Up” gesture as he was carried from the field has come to symbolize his fighting spirit. Following his rehabilitation at Craig Hospital, Mike founded the Mike Utley Foundation to support select research, rehabilitation and education for spinal cord injuries. Also at the dinner, South Metro Fire Fleet Services Bureau Chief Brian Brown and his wife Alice accepted the Dave and Gail Liniger Spirit of Craig Award. This award recognizes a Craig graduate and/or family member who, through their community service, professional achievement, and personal support of Craig's patients, graduates, and mission, significantly brings to life the spirit of Craig Hospital to others in the community. In 2006, Brian sustained a severe traumatic brain injury in a cycling accident on Mt. Evans. His rehabilitation at Craig made it possible for him to return to work 11 months post-injury. Brian and Alice are passionate Craig supporters and volunteers. They founded the Racing For Hope Cycling Classic, a competitive race to raise money for Craig. The 2016 event was chaired by Linda and Don Childears.